The Edgefield County Sheriff’s Office recovered a 12 foot aluminum boat that was stolen from property on Edgefield Road in Trenton only hours after the theft, Monday, Jan. 20. According to a report filed the ECSO, the owner of the boat contacted law enforcement officials after he saw his boat being carried away in a truck, the tag to which he was able to provide. A few hours later, a deputy on patrol on Hwy 25 near Fox Terrace in North Augusta (Edgefield County) spotted a vehicle loaded with scrap metal in the middle of the road. A passenger of the 1989 GMC truck stated the truck had run out of gas, and the owner was walking to get more fuel. The deputy assisted in moving the vehicle out of the roadway and observed that the tag on the truck was the same as that of the vehicle reported to have been involved in the earlier theft. 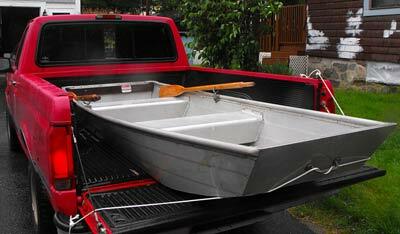 The deputy also noted an aluminum boat as part of the contents of the truck’s load. The victim in this crime was able to come to the scene and positively identify the vehicle as being the one that took his boat. He further identified the boat and other items in the truck as being his. The passenger of the truck admitted to helping load the boat onto the truck. He and a female passenger at the scene were both charged with receiving stolen goods less than $5000 and taken into custody. Deputies were unable to locate the owner of the vehicle, and the truck was towed from the scene.